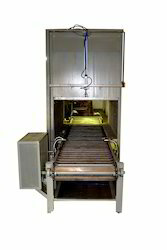 Our range of products include dryer conveyor. We are highly instrumental in manufacturing and supplying a huge range of Dryer Conveyor or Automatic Drying System that are widely used to dry the Industrial Components. It is automatid Drying System Uses hot air to dry the components. The structure is provided with thermal insulation and external enclosure which covers all components of the machine. The dryer is fitted with an impeller and motor, heating elements, thermostatic temperature control, hot air circulation system and automatic pneumatically controlled lid duly insulated. The operating temperature is thermostatically controlled and displayed by DTC mounted directly on control panel.